I have an old journal of family recipes that I keep with my cookbooks. The cover has long since fallen off, the spine is cracked and yellowing, and the pages are literally dog-eared from a former dog we had who decided to use it for teething, but it still holds some classic recipes and memories for me: Peanut Butter Fudge from my elementary school cookbook, English Toffee from my neighbor’s mom Audrey Herring, Apricot Chicken from a college friend, and from my mom, Crab Louis, her Cheese Ball, and that one family favorite that seemed completely exotic when she first made it for our family in the 60s or 70s, Chinese Steak. 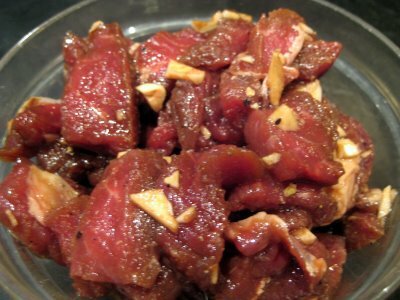 You start with some sirloin steak, trim all the fat and connective tissue, and cut it into thin slices. It marinates in a soy-garlic-ginger concoction while you get the vegetables ready. 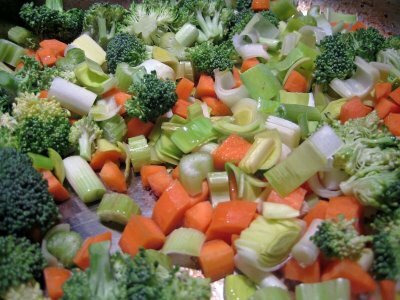 The original recipe calls for green onions, snow peas, celery and tomatoes, but I’ve taken to throwing in whatever I have on hand, so you noticed broccoli, celery, green onions, carrots, leeks and tomatoes above. 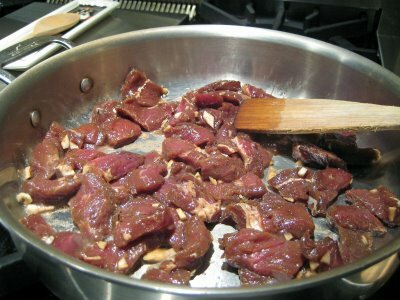 After the vegetables are cut up, go ahead and sear the meat until just browned in a large skillet or wok (if you have one – I’m too lazy to take mine out and clean it), then remove it to a platter while you cook the vegetables. 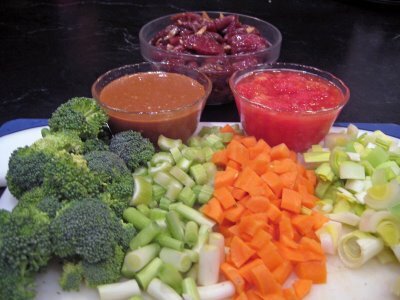 Add them to the same pan and stir fry until they just begin to get tender crisp – this is Chinese food, and you want some crunch in the veggies when you are finished. 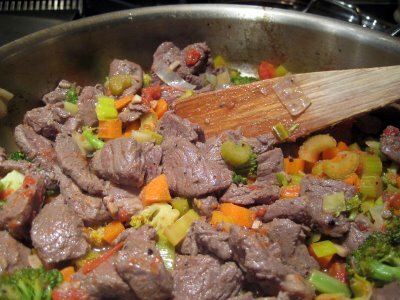 Add the meat back in and stir fry a minute longer, then add the sauce mixture and stir over high heat just until it bubbles and thickens. Serve immediately over rice – whatever variety you like. 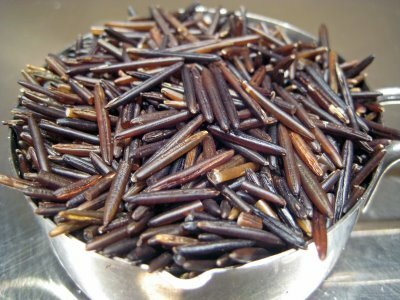 I’m currently enamored with this very long grain wild rice that I purchased at a farmers’ market. It doesn’t actually come from CO (I’m pretty sure we don’t grow rice here), but this one comes from the Wisconsin or Canadian lakes region and bursts open to a wonderfully nutty flavor that I can’t resist. Wild rice takes more liquid and a longer cooking time than long grain white rice, so plan accordingly.